Oscar Parkes OBE MB Ch B (1885-1958). Watercolour heightened with white, signed and dated 1918 (lower right). HMS KEMPENFELT was ordered under the 1913-14 naval building programme and was laid down at Cammel Laird's yard on Merseyside. Designed to be a flotilla leader she was signifcantly larger than typical destroyers of her vintage in order to accommodate additional flotilla staff and the extra communications equipment they required. War does amazing things to shipbuilding schedules: she was launched on 1st May 1915 and it was a mere 14 weeks later that she was complete and ready for commissioning! With Commander Harold Sulivan (only one L was to cause him problems throughout his career we are told!) she joined the 11th Destroyer Squadron based at Scapa Flow in the Orkneys: also resident here was the great bulk of Admiral Sir John Jellicoe's Grand Fleet and the 11th was detailed off to act in support of the main battle fleet. Thus it was that KEMPENFELT was in company with the C-in-C when the Grand Fleet sailed from Scapa on the night of 30th May 1916 in response to intelligence that the opposing German High Seas Fleet was underway from German naval bases. 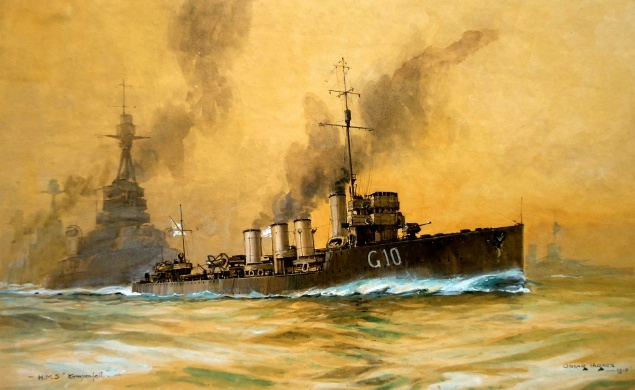 She remained with the battle fleet throughout the ensuing Battle of Jutland where the ship clearly distinguished herself for on 20th June 1916 when the Jutland Awards list was gazetted, Commander Sulivan was appointed a Member of the Distinguished Service Order ( DSO). The ship remained in service only for a few more years and in 1919, with massive fleet reductions required, HMS KEMPENFELT was placed under Care and Maintenance on 17th October and her final voyage to the scrapyard was not long delayed. Dr Oscar Parkes, a practising General Medical Practitioner, had served in the Naval Intelligence Division at the British Admiralty during the Great War and when he left the Service in 1920 it was to be editor of Jane’s Fighting Ships, a post he held until 1935. He had always drawn and painted we are told and some of his watercolours, always hard to find, are very well regarded today, this one of KEMPENFELT being a fine example.